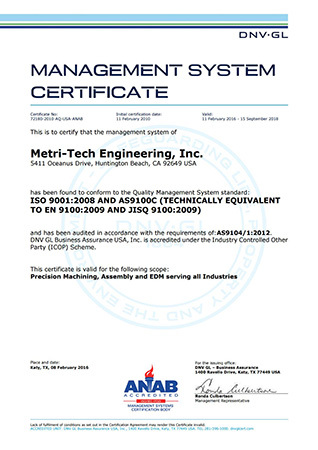 Quality - Metri-Tech Engineering, Inc.
Acquired AS9100 Certification Before It Was In Vogue. Metri-Tech has always pushed to be at the forefront of developing quality protocols and emerging technologies. So, while most companies were working with the widely accepted standard Mil-I-6872, and contemplating an eventual transition to the new ISO 9001:2000, Metri-Tech was already proceeding with a more advanced quality protocol that was still in its infancy, AS9100. MTE, already aware of the changing standard at the prime customer level, had already become self certified to AS9100A in early 2002, well before even the most advanced companies had made the transition. In fact, a prime aerospace manufacturer scheduled a quality audit at Metri-Tech Engineering in late 2002. As is standard practice, the auditors requested MTE’s quality manual and went to the conference room to begin their review process behind closed doors. One hour later, they emerged from the room and told us that they were not qualified to audit to the AS9100 standard. They concluded the closing meeting by advising us that we were on the right path and years ahead of the industry, and to just keep doing what we were doing. A properly developed quality system consists of more than just some work instructions and an idealistic set of quality expectations; it’s the lifeblood of a manufacturing organization. Just as a very talented third party auditor once quipped to us, “welcome to the beginning of the rest of your life,” seeking certification to the AS9100 standard requires a permanent commitment to strategic processes and detailed documentation. Although the organizational commitment is permanent, the AS9100 standard is not. Metri-Tech has already initiated the transition towards AS9100D, culminating in a new certification to be completed at our next annual audit in 2017, even though it will not be mandatory to update to Rev. D until the middle 2018. Just as we did 15 years ago, MTE will once again take the proactive approach of transitioning to the highest level of quality system certification available, long before our peers are willing to invest in the transition. Our proactive approach to quality goes well beyond our desire to always maintain our certification to the latest version of AS9100. We are fully invested in the quality of the products we produce from all facets. Metri-Tech recently purchased a Zeiss Contura CMM to assist us with our devotion to uncompromised quality. We also purchased a Thermo Fischer Scientific Niton XL-5 XRF Analyzer to ensure compliance with new standards for Conflict Minerals Regulation, RoHS, REACH, and California Proposition 65. Metri-Tech is dedicated to manufacturing the highest quality available, and continuously makes the sacrifices necessary to ensure that our customers receive parts that are far beyond their expectations. Uncompromising quality, it’s what we say, and what we do. Our proactive approach to quality goes well beyond our desire to always maintain our certification to the latest version of AS9100. We are fully invested in the quality of the products we produce from all facets.